Spicy Treats: Pomegranate Semolina Pudding / Pomegranate Rava Kesari - Easy Valentine Indian Sweet!! 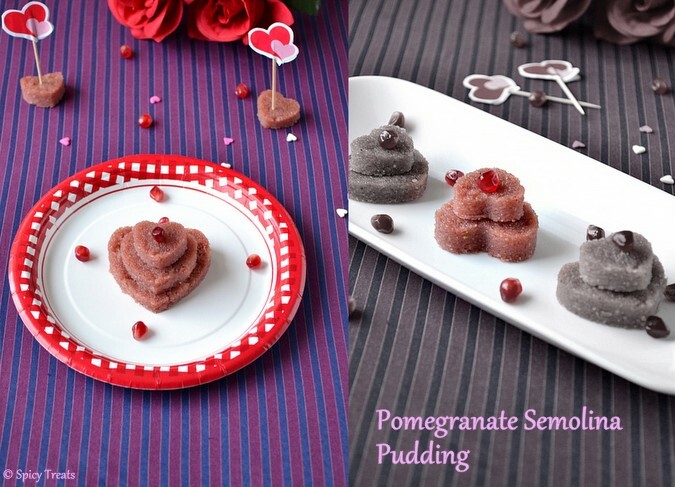 Pomegranate Semolina Pudding / Pomegranate Rava Kesari - Easy Valentine Indian Sweet!! First i thought to make kesari using strawberries to get a nice pink colour but the strawberries were bit sour So i changed my mind to try it with Pomegranate juice. But i was worried about the taste and called my mom. First She was so excited and appreciated me for my creativity. Then told me to proceed and also shared the sugar, juice n rava measurement. After talking to my mom i got some confident and proceeded my cooking, to my surprise it came out so well and my kids too loved it. It tasted same like regular rava kesari with very very light sour taste here n there. Take pom seeds from one Pomegranate and put in the blender, add little water and blend to a smooth juice then strain it using mesh strainer and keep the juice aside. Now heat 1/2 tsp oil in a pan, then add semolina and roast for 1-2 minutes or till flavor comes and it turns light golden brown. once done remove from the stove and transfer to a plate and keep aside. Then pour fresh pom juice to the pan and bring it to boil, once it starts boiling add semolina and keep stirring. After a minute it will start thicken like upma, now add sugar and keep stirring for another 2-3 minutes or until the sugar smell leaves. At the stage add ghee and cardamom powder and stir for a minute and switch off the flame. If u want u can add roasted cashews and raisins now, but i skipped since i planned to cut out to heart shape. If u want to shape it, as soon switch off the stove transfer the kesari to a greased plate and spread it and allow to cool or refrigerate. After cooling cut into desired shapes and serve chilled. Do not add ghee/butter more than the mentioned quantity since the fruit flavor is dominant it won;t taste good with more ghee. If u want your kesari to be mushy n halwa like texture then add 2 cups of water. I have made the kesari using pomegranate juice but u can also make it using half water n half juice - 3/4 cup water n 3/4 cup juice. Sending this recipe to Vardhini's Sweet Luv 2013 event, Priya's Valentine's Day Recipe Contest and to Sending this recipe to the event, Passion On Plate Giveaway Event hosting by Faiza kader. delicious pudding, looks absolutely yummy and lovely presentation. wow very lovely cute heart presentation... must be delicious kesari akka... well made..
Lovely variation to the regular kesari...Your beautiful presentation is very apt for Valentine's day. love the idea of using pomegranate juice, gr8 recipe. looks inviting and innovative,loved the color of the kesari..
Lovely idea, looks so cute and pretty !! Wow that looks so beautiful, luvly presentation dear. such an innovative recipe... i can never think like this... perfect.. when everybody is going strawberries and chocolate this valentines.. lovely!